Here's my card for January's Viva la Verve sketch. I used the layout to make a sympathy card. These are hard to make on demand, so it's good to put together a few like this one to keep on hand for when they're needed. I used a neutral, earthy color scheme with shades of green, cream, and kraft. 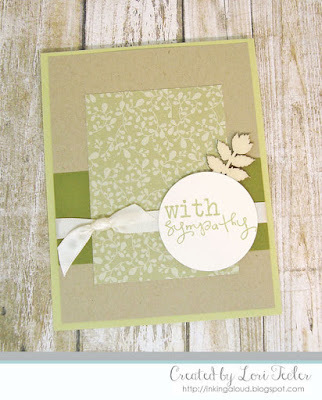 The green on green leafy patterned paper I used for the large panel on the cardfront goes nicely with the wood veneer accent that I tucked beneath the sentiment panel. The "with sympathy" sentiment is from Verve's Treasured Words set. It just fit on the cream circle that I stamped it in on. The finished panel was adhered to a pale mossy green card base that will be light enough to write an easy to see heartfelt and comforting message to the card's recipient. Such a peaceful card, Lori! Love the earthy tones. So glad you could join us for Viva la Verve! Congratulations! This is a gorgeous card - such lovely colors.